We will return in this blog shortly, to a discussion of the different kinds of personal healing which are made manifest in Jesus' life on earth. Most of what we have discussed so far has been from the individual's perspective: physical healing, emotional healing, spiritual healing, healing and deliverance, and the Healing of the Cross. Before moving on though, to the particulars of the 'kinds' of personal healing, we stop to describe an aspect of scripture and teaching that in modern times has only been briefly alluded to, but is just as essential and works similarly in macrocosm to personal healing. 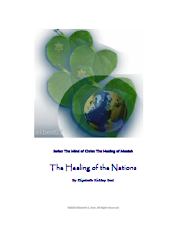 The issue is the "Healing of the Nations". We think often about the idea of the healing of bodies and occasionally of minds, but we do not think often about the "healing of nations", and yet if one looks at the world today, it becomes obvious, that healing is more needed on the national level than anywhere else. To most, that would mean a lack of conflict, and while that certainly would be central, it does not imply a one world government. In perfect healing, diversity can exist and so can peace, but that is not often understood today. The Healing of Nations though, is only mentioned in those exact words once, but is seen as a theme throughout the Old and New Testament. When issues of healing nations arise, Israel is most often the 'prototype' which God holds up, to show how He deals with nations. This is why we can often apply the principles and commands God used in dealing with Israel to other nations across the centuries, because though Israel was unique as a divinely appointed theocracy among nations, it also acted as a 'firstborn' and ensample for all to learn from. In another bible study, we discussed the issues of national healing with regard to the Potter's Wheel Jeremiah mentions, while speaking of the Potter [God] being both the Creator and Destroyer of the pot: the word itself can refer to both. When a nation is either not formed correctly or strays from a right path, healing is necessary, or the nation is destroyed, that a new thing may be created. This is why there is a constant cry from God's heart throughout scripture to bring Israel back to her God and to righteousness: to 'right ways', for it is not in the heart of God to destroy even a recalcitrant nation. The passages in Jeremiah which deal with the breaking of a nation though, also shows a standard way God deals with a nation He rightfully deals with: with the harsh and sometimes almost unbearable 'destructions', come also covenant and promise of healing, making whole, and setting right the nation which has erred. III. The Promise given upon forthcoming Judgment when Israel [or nations] fail to repent, of Mercy, and the covenant of taking the desolations and turning them to the good. The one difference between Israel and other nations in the way God deals with them, is that God does not seem to be under any 'contractual' or covenantal obligation to restore or have mercy on a 'pagan' nation, especially if it is an enemy of Israel. Assyria and Babylon, once they had been used as God's 'sword' against his own people as an instrument of judgment and chastisement, is not promised a return to grandeur, and in fact neither returned to the grandeur of the time ever again! In sum, though, the above pattern of God's dealing with and healing broken and even rebelling nations often holds. Service, care (hence healing), household. And 'therapon', a related word is a servant or person who renders service. The ideas which emerge are a submission and service, within a body, and those principles at least are quite applicable to the healing of nations. Ethnos, from which we derive the word 'ethnic' refers to nations which are Gentile, pagan, or foreign, often described as 'heathen' or a 'people'. Various levels of persons within a government are similarly derived such as 'ethnarches' which means governor, ethnikos, which refers to a pagan or Gentile , or Ethnikos as an adjective referring to 'after the manner of Gentiles'. While a word study is not enough by itself to intuit all of God's purpose or plan in the healing of a nation, it is clear that the intent of God with regard to even Gentile nations [goyim] is healing and 'setting right' and 'making whole' and according to their divine and expected purpose. 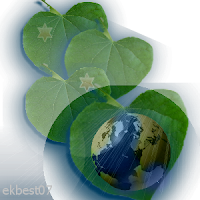 A fascinating aspect of this study, which we will examine in more detail later, is that it is the Leaves [Phyllon] of the tree of life, the one that sits in the midst of Eden and Heaven, that are 'medicinal' to the healing of nations, and I posit that to mean both metaphorically and literally. We will turn in the next study, to look at what the characteristics and descriptions are of 'national' healing.